Sometimes, I find, a visit to a good, old fashioned blank spot on the map is in order. Public and private beta is indispensable, but structured route information (like guidebooks and blogs) often turns into a checklist and can stifle creativity when it comes to selecting a route. Alternatively, new areas are a shot in the dark, and can often be disappointing at best, heinously uncomfortable at worst. Thus, a reliance on beta is probably one’s best bet when it comes to consistent and high quality skiing (or whatever), but by definition, you’re not going to be doing anything new. Having gone after local classics for much of the spring, Casey Wilcox and I set out to explore a piece of Terra Incognita, at least as far as skiing goes. Red Mountain, at 9414′, is the highest point in the Bob Marshall Complex (higher than the Swan, higher than the front). It is, however, distinctly more subtle than its slightly lower and better known competitor, Holland Peak; it is not obvious from any highway, and it’s a bit further from Missoula. Access is via the Lander’s Fork of the Blackfoot, up a decent dirt road that is drifted over until late in the season. The terrain is relatively rounded compared to the glacier sculpted rock-and-ice massifs of the Swan or the Rocky Mountain Front, and the country is dry, cold, and mostly burnt from the Canyon Creek Fire, which devastated the Scapegoat 25 years ago. There aren’t many lakes. It doesn’t snow there much compared to the western and northern parts of the Bob, and the westerlies whipping towards the nearby continental quickly blow bare all the ridges and west aspects, leaving the blonde shales and eponymous red quartzites and slates exposed everywhere but the sheltered north and east aspects. Nobody ever called Red Mountain a crown jewel. Red Mountain is remote, and sees very little traffic. As such, it is a playground for grizzlies, who root for tubers on the hillsides; their tracks are abundant and ubiquitous. Goats also live on the highest reaches of the peak, where the lack of snow makes for easy foraging on the lichens and abundant alpine Forget-Me-Nots, for which this part of the Scapegoat is known. The skiing is very good. We left Missoula at 4:45, driving eastward, and keeping pace with cloudy skies and a rapidly departing cold front. After an hour or so, we turned up the Lander’s Fork, and then Copper Creek, where we got our first glimpse of a large couloir off of a subsidiary peak to our objective. There was a lot of snow in the valley. There wasn’t very much snow on Red Mountain. After rallying the Toyota over some robustly refrozen drifts, we decided it was probably wise to position the truck such that we would be on the highway side of these when the drifts became not frozen. Thus, more rallying. The walk up the road was only a few hundred yards, and then easy walking up a burn covered with corn. We reached a low point in the ridge above the Copper Camp Snotel quickly. A strong and icy wind was present at the ridgeline, and we spent a few minutes huddled in council about which direction we were supposed to go and donning layers. After a false start, we made the right choice, and proceeded northward. 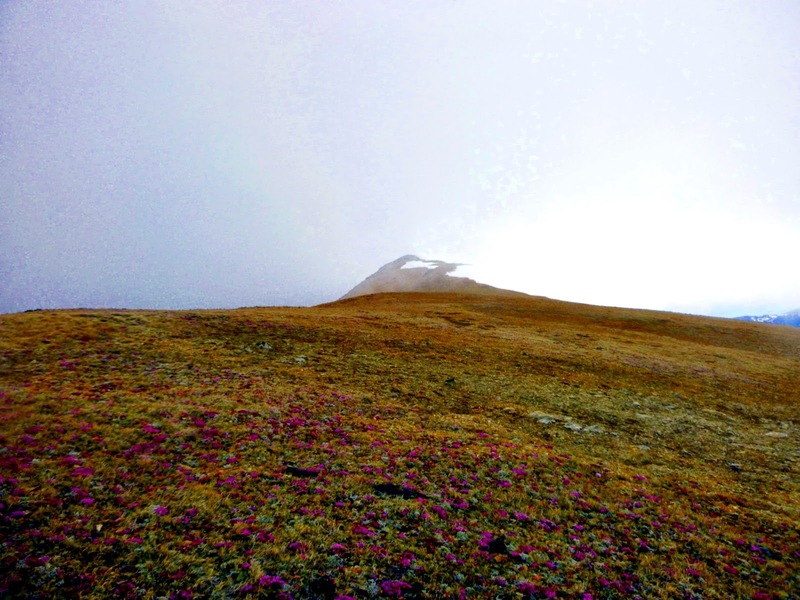 We walked the ridge for a few miles, admiring the flowers, getting blasted by icy wind, and crossing deeply sunken grizzly tracks left by a very large bear on a much warmer day. The ridge walking was easy (with the exception of a short third class step) and pleasant, and the bowls on leeward aspects were well filled in, though absolutely bulletproof. The ridge ascends and descends two sub-peaks before reaching the summit of Red Mountain. Alpine Forget-Me-Not on the ridge below Red Mountain. By the time we summited, some of the cloud banks were beginning to clear, and the wind becoming less icy. 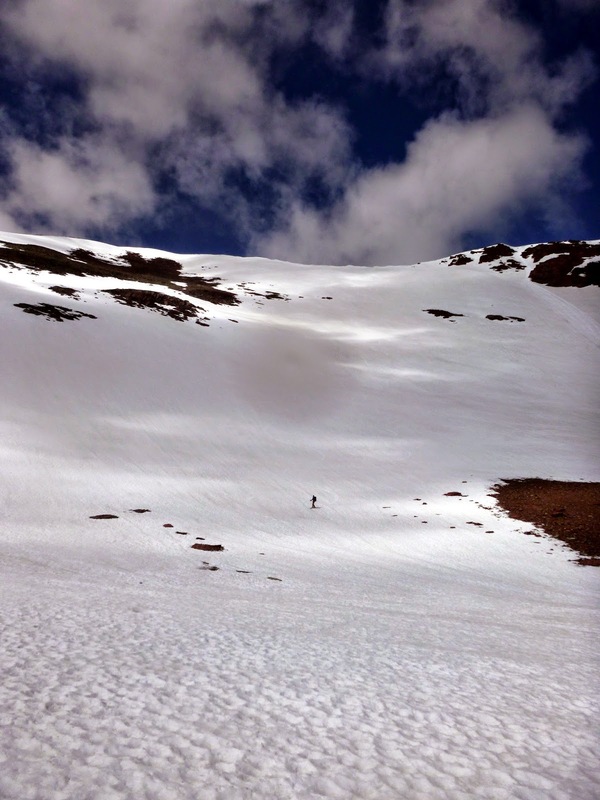 I investigated a pair of long couloirs on the western side of the peak that I had hoped to ski. They were snow free, and so we opted against skiing them, settling instead on the 1800′ northeast face. Snow conditions on the ridgetop were still dishearteningly hard, and some waiting seemed like a good idea. We are both, however, terribly impatient with this kind of thing, and I dropped over the steep cornice. To my surprise, I found firm but suitably edgeable corn, which steadily improved as I descended this steep and open face. Despite expectations. We were bolstered by the unexpected snow quality, and quickly transitioned to crampons for the climb up to Red Mountain’s east ridge. 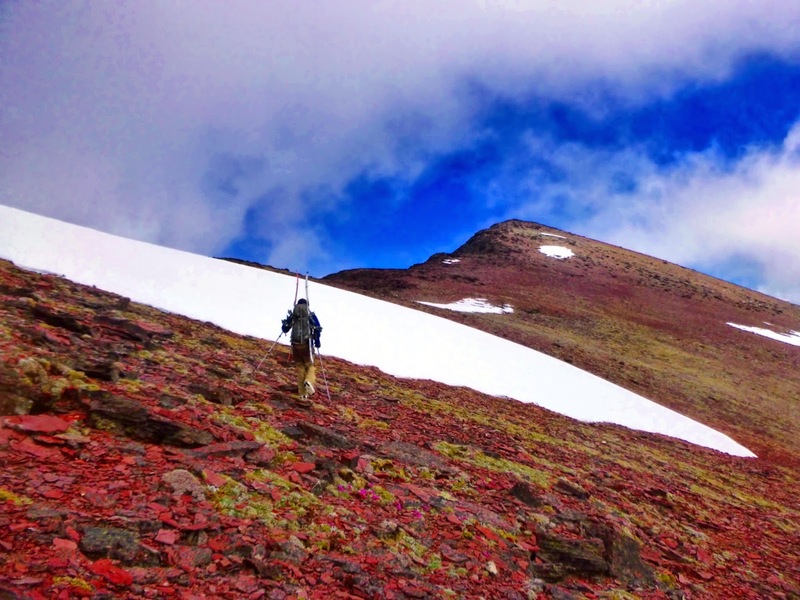 Approaching the summit of the appropriately named peak. Northeast face of Red Mountain. It was apparent that conditions were game-on; the refreeze the night before, the countless freeze/thaw cycles, and the low high for the day meant that just about anything was suitable for safe skiing. As we climbed back up towards Red Mountain, we saw that the next sub-peak to the south (Blonde Mountain?) held another vast northeast face, that rolled from a mellow face onto a big and exposed affair bisected by cliffs, that looked superb. We quickly walked to the top of the face and dropped in. The top of the roll-over was spooky and confusing, but Casey quickly found the appropriate chute descending through the cliffs, and we regrouped at a tarn at the bottom of the face. Run number two was through the cliffs on the left side of the photo. We didn’t have much of a plan from this point, but were quite enthused by the previous run. As such, we decided to bowl bounce the remainder of the return to the truck. We reascended the east ridge of Blonde Mountain, and in so doing spied an extremely compelling couloir with at least 1000′ of vertical and rock walls dropping from near the ridge, into the basin. We traversed above cliffs to the entrance of the couloir, where the wind scoured and low angle ridgeline abruptly gave way to cliffs, with this highly aesthetic couloir threading perfectly between. The couloir was very similar in steepness and character to Greywolf’s south couloir, but a bit longer. From the bottom of this couloir, we ascended sub-ridges and skied two more bowls and one more short, steep, and spectacular couloir before finally attaining the last ridge whose south face would deliver us back to our vehicle. 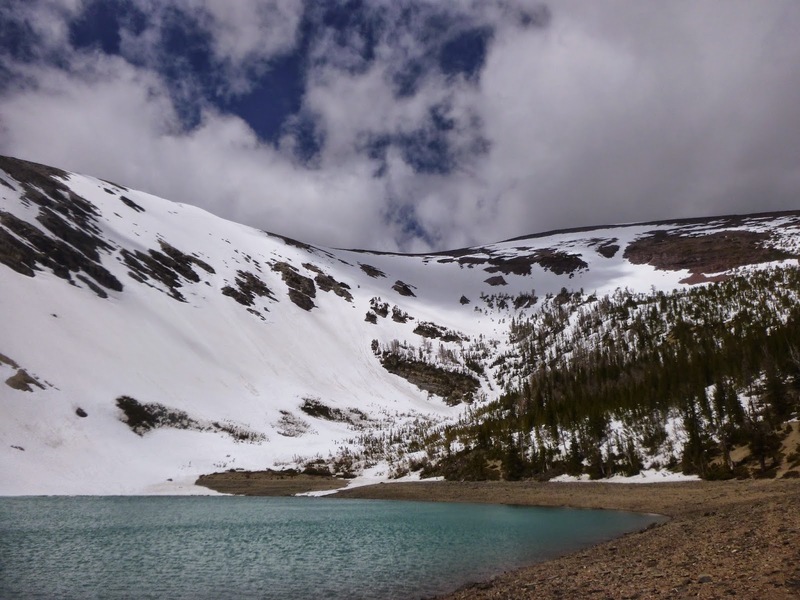 The snow had gotten progressively softer at lower elevations and the return to the rig was an enjoyable cruise through an old burn and over snow-bridged creek bottoms full of meltwater. 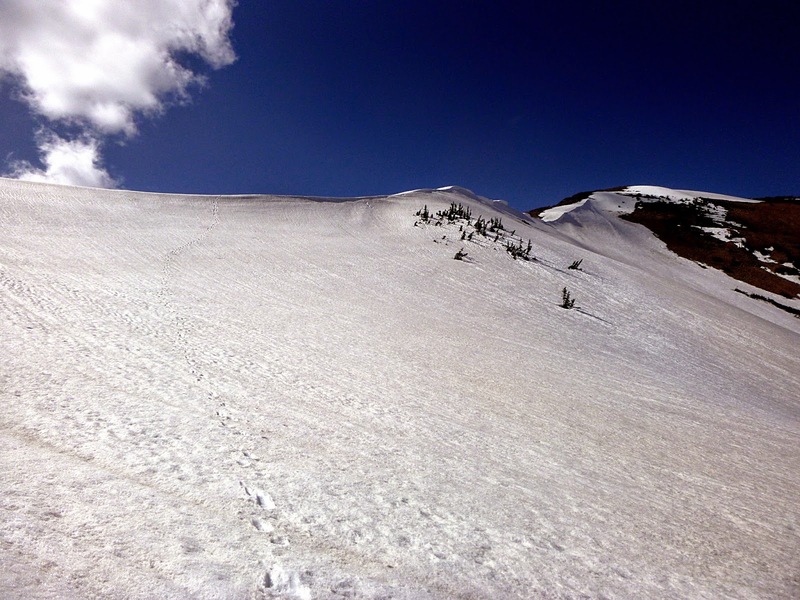 No bushwhacking, plenty of bear tracks, and we were able to ski to within a few hundred yards of my truck. For the day, we skied right around 10000′ of vertical, and done in 11 hours car to car. I would highly recommend exploring this zone to anyone wishing to explore a beautiful and unique area far from the beaten path. 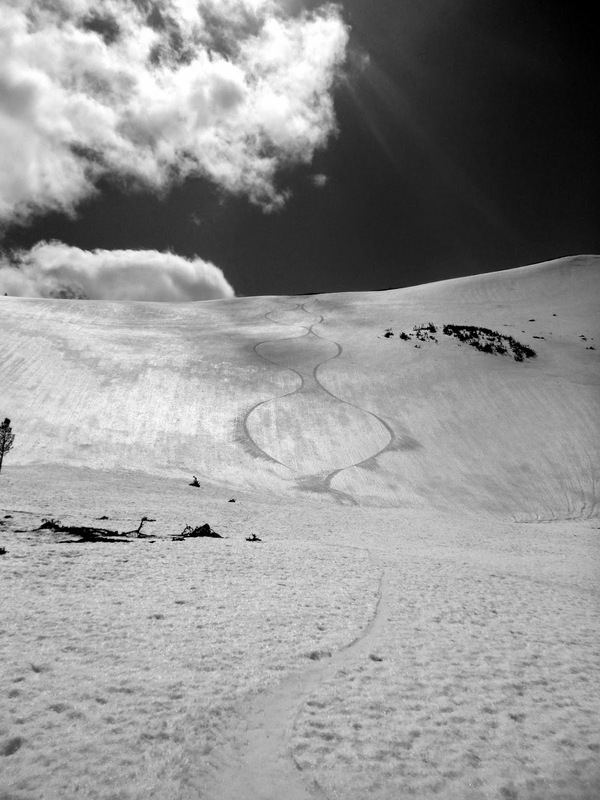 I am also curious if anyone has skied these lines before and if anything has been named. If you know, let me know. As a Scapegoat bonus, on Saturday evening Helena joined Molly and I for Molly’s last long run before the Pengelly Double Dip. We ran to North Fork Falls on the North Fork of the Blackfoot, a round trip of 14 miles. 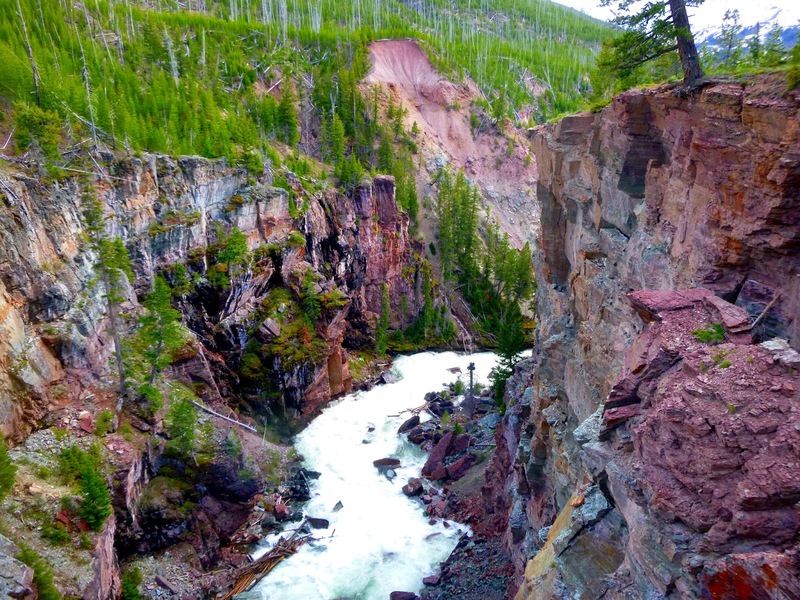 The falls are formed by a young anticline composed of the same layers that form the summit of Red Mountain pushing up through the softer surroundings. It’s an imposing place during spring runoff, as this pretty big river drops four-hundred feet over half a mile. The North Fork of the Blackfoot just below the main pitch of North Fork Falls. Previous PostHarvest Time.Next PostSkiing in summer!